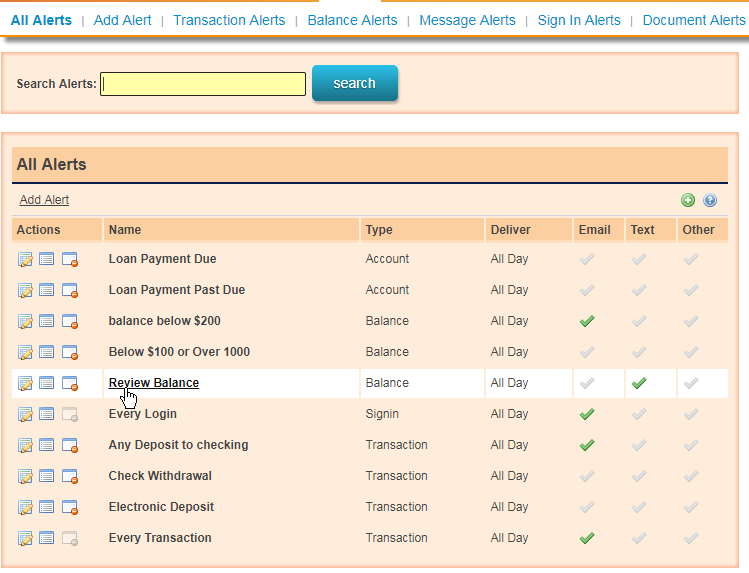 Set up text and email alerts that are customizable to you in your Logix Online Banking account. For example, you can create alerts for those moments when you're expecting an electronic deposit or withdrawal, or for when your balance goes below a certain dollar threshold. The best part? You decide what kinds of alerts you want to receive and the frequency. Choose from our provided list of alerts or create your own! You'll start receiving alerts within 30 minutes of activity on your account. How do you sign up? 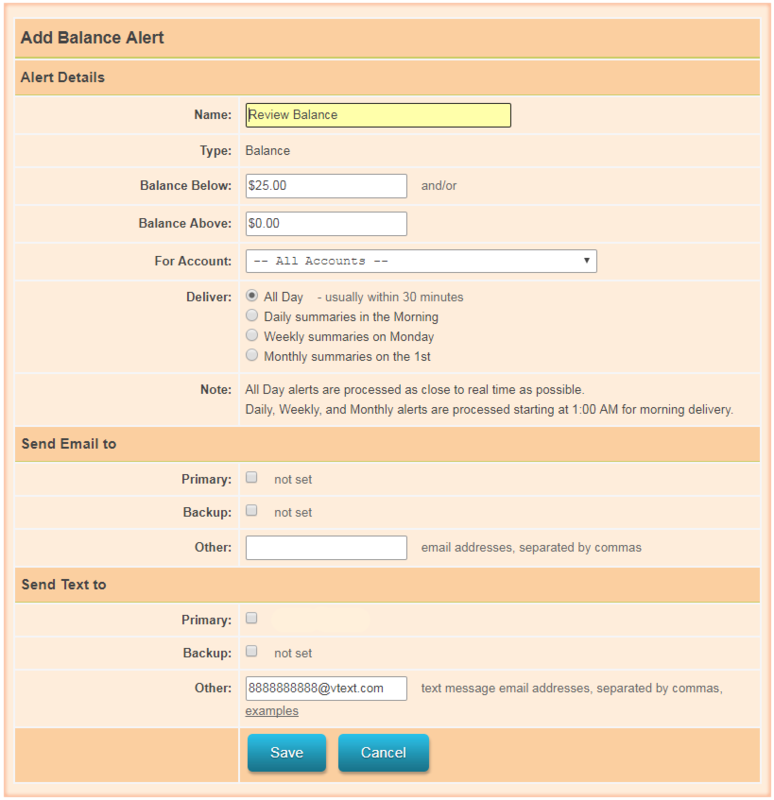 Review this animation for creating a "Balance" alert or follow the steps below. You may want to click "refresh" on this post to see it from the beginning. 3. Choose the Alert option that best describes the type of alert you want. Check the boxes where you want the alert sent to (Email and/or Text). Your "primary" email and phone number will automatically populate. Under Send Text to, enter a text "email" address in the Other field. Click examples for setup based on mobile carrier. For mobile carriers not listed, run a quick online search for the sms email to use for your mobile carrier. Enter your mobile phone number (without dashes), followed by the @ symbol and your mobile carrier's email address for text. Once your shiny new alert is saved, don’t be surprised if you can hardly wait to receive a text or email with your alert. If you need to make changes to the alert or no longer need it, edit or delete it with a simple click of a button. Feel free to experiment with them. They're here to help. Stay tuned for more blog posts on this OLB Tips and Tricks series! Next month, we’ll be addressing how to set up your accounts with extra protection using Multi Factor Authentication (MFA) on your cell phone. If you don’t want to wait for the article, call us now at 800-328-5328 to get set up! Also, if you know any Logix members who could benefit from these text and email alerts, please share this post with them. Kay started with Logix in early 2009 and has held a few different member service roles. She enjoys sharing her positive learning experiences with hopes that we can all continue down the path of smarter banking.